The first budget delivered by India’s recently elected BJP government on 10-Jul-2014 included a number of measures that have been highly welcomed by the country’s tourism industry including the planned introduction of electronic visas; the abolition of service tax on packages sold to foreign tourists; plans to invest in upgrading attractions of religious and cultural significance; the development of tourist trains connecting pilgrimage sites; and the construction of a major convention centre in Goa . Although some of these announcements are long term objectives and will not have an immediate impact on visitor numbers, they nevertheless reflect the priority attached by the administration to tourism as a driver of economic growth and employment. Tourism is one of the five Ts which the Prime Minister had earlier announced as being the keys to enhancing India’s global brand, with the others being Talent, Tradition, Technology and Trade. Airport retailers potentially had something to cheer as the duty free allowance for returning Indian nationals was increased by almost 30% to INR45,000 (USD750) per person. However to take advantage of this retailers at Indian airports will need to increase the range of electronics, cosmetics, fragrances and accessories available on arrival, otherwise the benefit will derive to overseas airports from where passengers depart for India. Arrivals sales accounts for around 60% of duty free revenue in India, however this segment has traditionally been dominated by alcohol (which saw no change in allowance) and tobacco (for which the allowance was halved to 100 cigarettes or 25 cigars). A sharp increase in tax on cigarettes in the domestic market which was also announced last week has increased the differential with duty free prices which may stimulate increased sales on departure. But there was nothing in the budget to provide any relief to India’s ailing airlines, which lost an estimated USD1.7 billion in FY2014. A reduction in sales tax on fuel would have been the single biggest confidence boost that the government could have delivered to the airline industry. However this would have been a very ambitious objective within to achieve within the six weeks that the new government has been in place. There is also a possibility that a 12.36% service tax may be applicable on aircraft lease payments from Oct-2014 which would further challenge airlines, however this is yet to be confirmed. In the following brief extracts from the forthcoming CAPA India Inbound and Outbound Tourism Reports we review some of the key trends in visitor flows and highlight key developments related to visa requirements which could spur growth in international traffic in India. estimation of the influence of aircraft technology on the viability of new routes that could support inbound and outbound traffic – this encompasses wide body A380s/A350s/787 for medium and long haul market as well as the impact of LCCs operating re-engined narrow bodies. Inbound tourism to India has increased at a robust rate of 9.6% per annum over the last decade, growing from 2.7 million in 2003 to 6.9 million in 2013. Growth was much faster in the first half of the period, spurred by the liberalisation of market access for foreign carriers from 2003/04. Arrivals dipped briefly in 2009 in the aftermath of the Mumbai terror attacks and the impact of the economic slowdown in the key source markets of North America and Europe, but have since resumed growth, albeit at a slower rate. CAPA India Inbound Tourism Report includes detailed analysis of historical data on foreign visitor arrivals and present forecasts by source market at national and state level through to 2023. Despite the steady growth, India’s 6.9 million visitors represent just a fraction of the destination’s potential, given its wealth of natural, historical and cultural attractions. And close to 30% of these arrivals were persons of Indian origin who were visiting friends and relatives. After excluding business travellers and others, the pure leisure and recreational tourist numbers are estimated at less than 2 million. CAPA India Inbound Tourism Report identifies major and emerging market segments including including corporate travel, MICE, VFR, group tours, independent travellers, pilgrims, seniors, single travellers, medical tourists, culinary tours. By way of comparison the city state of Singapore attracts more than twice as many tourist as the whole of India, while competing destinations such as Thailand and Malaysia receive in excess of 25 million visitors per annum. CAPA India Inbound Tourism Report includes analysis of key competing destinations from the leading source markets identifying key strengths and weaknesses. Until 2010 visitors of all nationalities (except those from Nepal and Bhutan) required a visa to enter India, which had to be obtained prior to departure. Due to national security concerns, border protection has been an understandably sensitive issue in India. But the lengthy and cumbersome application process was considered to be a major deterrent to both leisure and business visitors alike. In Jan-2010 a visa-on-arrival facility was introduced for citizens of Finland, Japan, Luxembourg, New Zealand and Singapore, visiting India for tourism purposes. One year later this was extended to a further six ASEAN countries, Cambodia, Indonesia, Laos, Myanmar, the Philippines and Vietnam. South Korea was added earlier this year. 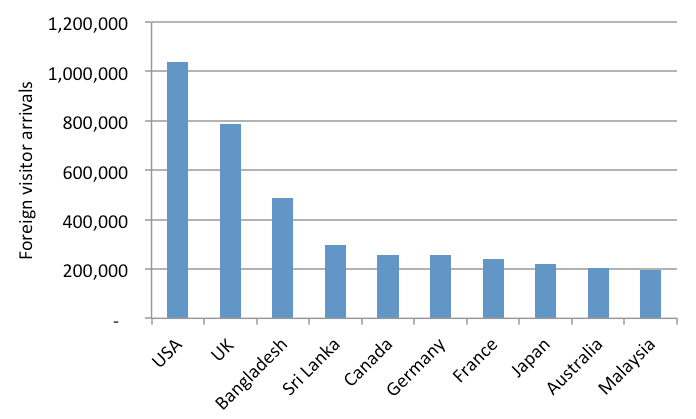 However, of these 12 eligible countries, Japan is the only one that features amongst the top 10 inbound markets. As the visa-on-arrival option has been limited to just a handful of mostly small source markets it has not had much impact to date. Only 20,294 tourists took advantage of the facility in 2013. But even amongst eligible nationals the take-up rate has been low. 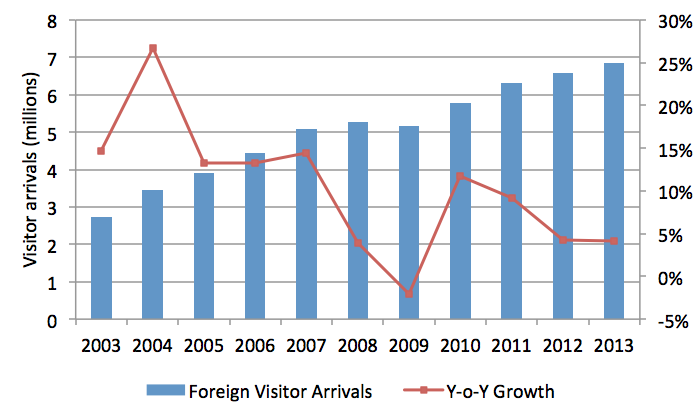 For example, just under 3% of Japanese visitors applied for their visa upon arrival in India. In last week’s budget the government announced that electronic visas would be available within six months at nine airports for a much larger group of countries, including most of the leading source markets. It should be noted that the proposal to introduce electronic visas for all but a few nationalities considered high-risk was announced by the previous administration, and last week’s statement is simply a confirmation of this. Further details are awaited, including the markets that will be eligible and the format of the revised visa application. It is not yet clear whether tourists apply for and receive their visas entirely online prior to departure, or whether it will be the less preferable option requiring visitors to line-up and submit their forms on arrival, as is the case for the current limited facility. This can result in lengthy queues and a frustrating initial experience for arriving passengers. Implementation of the electronic scheme on a broad scale may be challenging and will need to be carefully managed. In the last few days since the Budget announcement the Minister for Tourism has made further encouraging remarks that in addition to simplifying the visa process, a proposal is also consideration to significantly reduce the visa fee to make it more competitive with other destinations. CAPA India Inbound Tourism Repor includes a review of the proposed changes to the visa framework for foreign visitors and analyse the reasons for the poor take-up of the current limited visa-on-arrival facility. Any measures that enhance the attractiveness of India as a destination from an ease and cost perspective will be welcome by tourism operators and airlines. But a more liberal framework will be particularly beneficial for stimulating spontaneous travel from Asia and the Gulf, much of which is in the operating range of LCCs. At present a special deal on an LCC from Sharjah to Goa this coming weekend is of little benefit to a UK expat residing in the UAE that is unable to obtain a visa in time to travel. But to take advantage of visa liberalisation airlines and tourism operators will need to work more closely together to develop appropriate products and marketing campaigns. CAPA India Inbound Tourism Report assesses the effectiveness of the key marketing campaigns pursued by stakeholders in the including the Ministry of Tourism, state tourism authorities, hotel companies, tour operators and airlines. The plans to upgrade and to create new tourist circuits connecting sites of Buddhist significance – amongst several such proposals for other religious and historical attractions – will also support growth in visitor numbers from Asia, and reduce dependence on North American and European markets which current account for just over 50% of visitors. Asia is the third largest source region at 16%, but is growing much faster and the potential is tremendous. In 2012 India received just under 170,000 Chinese tourists, around half the number that visited its tiny neighbour, the Maldives last year. CAPA India Inbound Tourism Report reviews India’s long term national tourism strategy as well as state level plans including promotion and fiscal incentives to tourism operators, airlines and infrastructure developers. The central government can play a critical enabling role in making it easier for tourists to visit India by supporting the development of competitive air connectivity and streamlined entry requirements. It must also address the punitive taxation structure faced by airlines, hotels and other tourism operators which impact viability and competitiveness and result in a loss of economic opportunity. But ultimately the execution of a successful tourism product lies at a state level. Here the focus must be on understanding the entire tourism value chain encompassing transport, accommodation, upgrading the visitor experience at key tourist attractions, availability of guides, environmental issues, hygiene, cleanliness, safety and security. State governments also need to better understand the critical and integral role that aviation can play in achieving their tourism objectives. At present there is limited knowledge about the implications of issues such as bilateral negotiations, airport capacity and sales taxation on fuel on tourism flows. And the issue skills shortages must be addressed by encouraging the development of educational and training establishments that can enhance local employment prospects as well as the quality of service delivery. 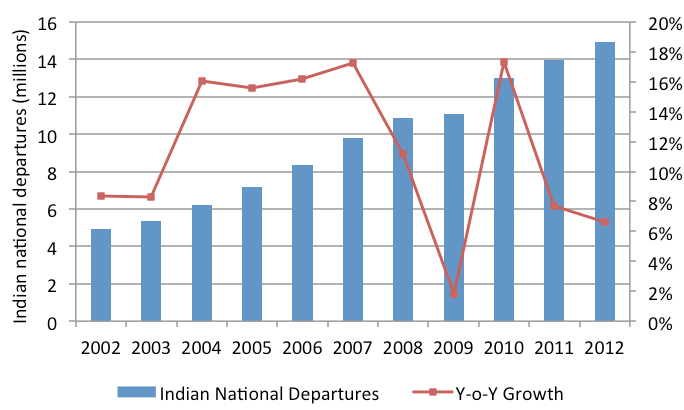 Based on the latest data available the number of departures by Indian nationals reached almost 15 million in 2012 having grown at a CAGR of 11.7% over the previous ten years. In 2013 CAPA estimates that the market grew by a further 8-10% taking it close to 16.5 million. This volume of traffic is making India an increasingly attractive market for overseas destinations. Thailand for example attracted just over 1 million Indian tourists in 2013, with Singapore, Dubai and the USA not far behind at around 900,000. India ranks among the top ten inbound markets for a wide range of short and long haul destinations such as Australia, Canada, Mauritius, Kenya and South Africa. CAPA India Outbound Tourism Report includes detailed analysis of historical data and present 10-year destination-wise forecasts both at an all-India level as well as highlighting the leading source states. The report will include in-depth commentary on purpose of travel, popular activities, booking patterns, expenditure, preference for single or multiple destinations. It will address behavioural and cultural trends related to frequency of travel, travel companions and the emergence of new holiday segments such as cruises, golf, diving, safaris, destination weddings and events, sports and festival-based travel etc. 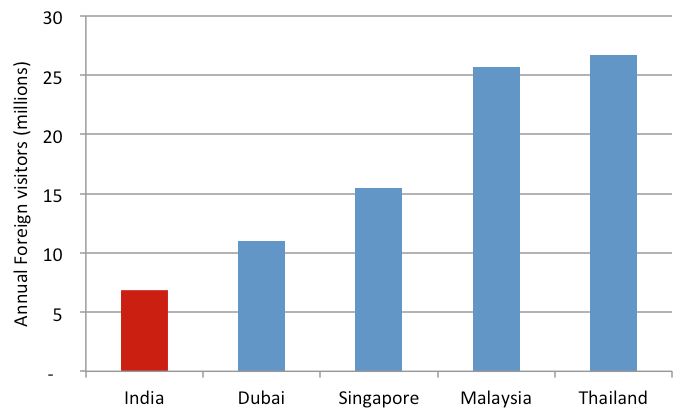 Given the strong upside growth potential of the market (99% of Indians did not travel overseas last year), several destinations are keen to encourage visitors from India through increased marketing and promotion; being used as a location for Indian movies; greater direct air service; and streamlined entry procedures. If India’s visa application process for foreign tourists is cumbersome, this is equally true for Indian nationals seeking to visit a number of countries, some of which require applicants to attend face-to face interviews and submit extensive sets of documentation including bank statements. CAPA India Outbound Tourism Report reviews the strategies of the ten leading international airlines to build outbound leisure traffic including a review of the latest trends in airline contracting with tour operators and agencies, and an assessment of the increasing role to be played by LCCs in influencing destination choice. However, there is increasing recognition that visa processes contribute to the competitiveness of a destination. More than 50 countries now offer visa-free or visa-on-arrival conditions for Indian nationals, mostly in Asia and Africa. But even destinations requiring visas are seeking to streamline the process. In just the last month three markets announced new initiatives for Indian visitors with Japan announcing that it would start to issue three year multiple visas; France committing to turning around visa applications within 48 hours from 2015; and Canada introducing the CAN+ programme under which applicants that have previously obtained a visa for Canada or the US in the last ten years would be processed within five days. CAPA India Outbound Tourism Report assesses the influence of national tourism boards on traffic flows with reference to their presence and budgets in the Indian market, promotional activities, destination positioning, use of social media, collaboration with the film industry and partnerships with airlines.